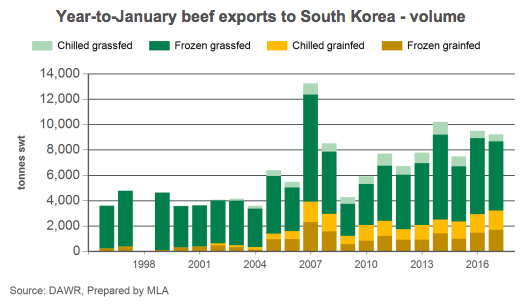 Sales of imported beef in South Korea are rising sharply in response to recent disease outbreaks in domestic livestock operations, according to South Korean media. 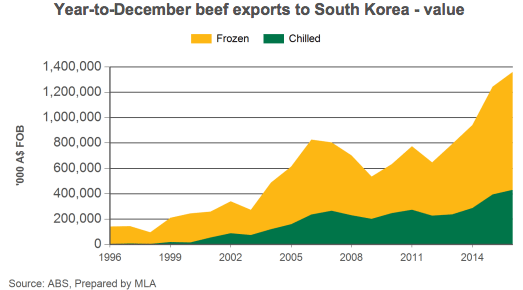 South Korea is Australia’s third largest export market for beef. Click on charts to view in larger format. Leading South Korean retail chain E-Mart said imported beef sales rose 12 percent last week compared to the previous week, while sales of Korean beef tumbled 19.6 percent. The decline came as the country’s fifth Foot and Mouth Disease outbreak was confirmed last Monday. Nearly 800 cows have been culled in the past week, according to the Yonhap news agency. On Thursday the South Korean government raised the watch level to the highest vigilance in the country’s disease control system, temporarily closing all livestock trading markets across the nation. “The supply of beef is not yet at risk, but the prices can go up if the situation gets worse,” an official from a discount store told the Yonhap news agency. As the avian influenza has been spreading in the country for nearly three months, prices of chickens rose 13.1 percent over the recent 10 days.